Enhanced interactive media offers additional revenue opportunities for TV broadcasters and higher conversion rates for television advertisers. Dan Hassan from BCM explained to me at the NAB trade show that implementing interactive TV services such as clickable ads can generate significant airtime revenue and additional service fees. Because the ads better satisfy the viewers and provide more conversion incentives and options, advertisers benefit. Implementing interactive services creates new challenges for TV broadcasters and there are some key options and solutions broadcasters should consider. In the past, request for information ads (RFI ads) required the use of slow marketing response channels such as direct mail which reduce the effectiveness. 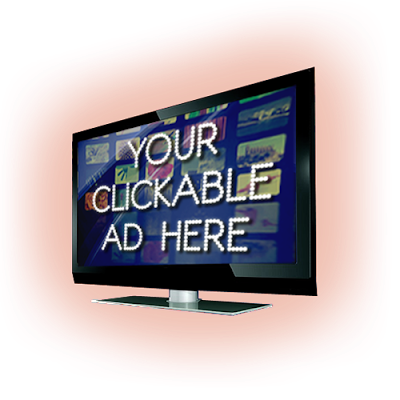 Clickable ads can enable immediate fulfillment (ordering) or satisfaction (registration). Advertisers can dramatically improve the effectiveness of TV spots. They can extend the viewing experience beyond the typical 30 to 60 second spots when they are interested in the product or service. Producing interactive TV ads requires the creation of new content and an interactive control process. To enable and simplify this process, BCM has created a system that supports the creation of clickable television ads called Clickable Moments™. The system embeds interactive Clickable Moments into television programs. It includes a mixture of tools and templates that allow broadcasters and media agencies to create and manage a new inventory of highly valuable interactive ads. Interactive TV systems need to work with existing headend broadcast systems which may be implemented in different types of technology environments. It must operate on existing viewing devices which have limited memory and processing capability. Enhanced binary interchange format - eBIF is a versatile industry standard that enables interactive applications that can work with existing systems and a mixture of legacy and newer set top boxes. The interactive programs are written in compressed and efficient binary code that allows it require less transmission bandwidth, smaller memory size (footprint), and reduced processing requirements. A byproduct of interactive advertising is the gathering of rich detailed interaction data. This can provide insight into which networks, programs, times (dayparts), and other criteria influence the success of the ad and identify when and how the viewer interacted with the ad (engagement).